During her discard phase, Zhuge Guo can show at most three hearts from her hand. The revealed cards do not count towards her hand limit for her discarding phase. At the end of her turn, Zhuge Guo can discard two equipment cards. If she does this, she is out of the game until her next turn. Once per game whenever she is on the brink of death, at the beginning of another character's turn, or during her action phase, Zhuge Guo can discard three hearts. She then becomes Goddess Zhuge Guo. 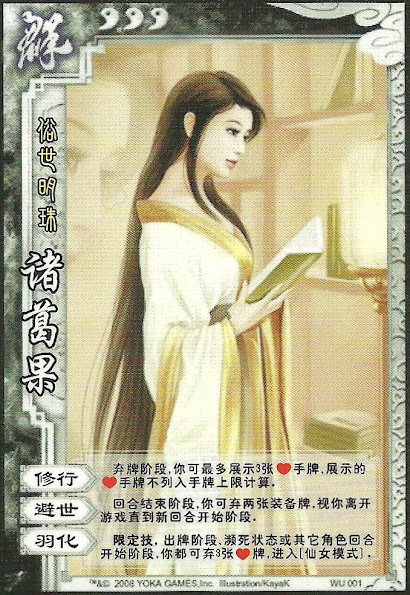 Zhuge Guo can use "Practice" to keep and extra three cards through her discard phase. She can use it for fewer if need be, but she cannot use "Practice" for more than three cards. Zhuge Guo can use "Ascend" when any of the three conditions are met. Also, it is optional for each situation, she she may wait for a better opportunity to transform.